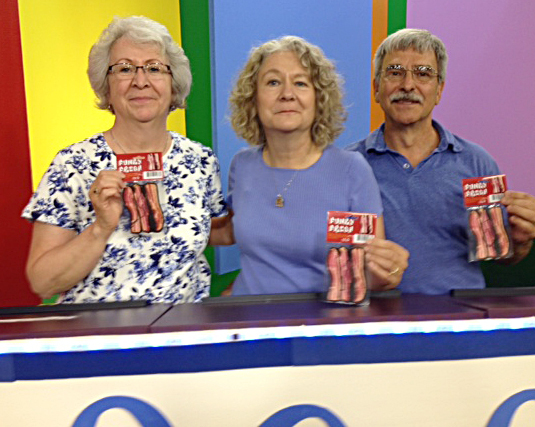 I had a great time being a contestant on Bragging Rights, the local trivia quiz show on WBBZ-TV. The show is recorded at the WBBZ studio in Eastern Hills Mall (near Macy’s), 4545 Transit Rd., Williamsville. You can be in the studio audience— I had the opportunity to do that, too, and it’s great fun. They show the studio audience during the opening sequence, so you could be on TV, too! Bragging Rights airs at 6:30 p.m. weekdays and our episode is scheduled to air at 6:30 p.m. Friday, July 25. My sister, Mary Hoffman of Cheektowaga, had the idea of getting a team together. She came up with the team name– the Quizards– because we’re quiz wizards. (I have a very creative family.) Mary was the team captain and chatted with our host, John Di Sciullo. My husband, Phil Stofko, was our third team member. He was in charge of strategy. The game uses a scoreboard that’s like a tic-tac-toe board, but has four squares across. If you get four x’s or o’s in a row horizontally, vertically or diagonally, you get extra points. Tip: Some people like to start in a corner, but Phil says in any game or sport, you want to control the center, so you should start in the center. The questions have to do with the classic TV shows run on WBBZ, local trivia and general trivia. Our opponents were the Mushrooms, who chose that name because they’re three fun guys. Get it? Mushrooms, fungi. You just can’t get away from the gardening references in Western New York! I don’t want to spoil the surprise, so I won’t tell you who won. I will tell you that at the end of the show our team received bacon-scented air fresheners and our opponents got bottles of pop with a flavor that is a combination of oranges and wings. Each winning team is entered to win the grand prize drawing at the end of the summer for three 40-inch LED televisions. You can find WBBZ throughout Western New York over-the-air on digital channel 67.1; Ch. 5 on Verizon FiOS (HD 505); Ch 5 Dish; Ch. 67 DirecTV, and these Time Warner Cable channels: Buffalo-Niagara Falls Metro area: Channel 5 (HD 1230); Batavia – Genesee, Wyoming, Orleans Counties Channel 71 (HD 1230); parts of Erie and Niagara Counties Channel 71 (HD 1230); Dunkirk Channel 99 (HD 1230); Olean Channel 21 (HD 1230); Fredonia – Jamestown Channel 72 (HD 1230), and Alfred- Angelica- Avoca- Bath- Bolivar Friendship- Hornell Channel 71 (HD 1230). WBBZ-TV is Western New York’s only locally owned and operated television station. This looks so fun – I’m glad you had a good time. Anybody who wins bacon scented air fresheners is certainly victorious! You don’t look happy Connie and you should be. I will be watching on July 25. I’m not sure why I don’t look happy because I definitely was happy. Hey– I was holding a bacon-scented air freshener in my hand! About 31 years ago I worked at BGH-CMHC with a man named Phil Stofko who had a girlfriend named Connie. We worked evenings as MHW’s . Phil, is that you? If so, glad to see you are still around I see Dwaine Fleming at the Rath Bldg often. Bill Daniels- Coordinator of Insurance – Erie County Dept. of Senior Services. Yes, I am the Phil Stofko from the days of yore!!! Worked at BGH for over twenty years as a MHW, counselor, and neuropsych tech(which I still do in private practice with a neuropsychologist). We currently live in Amherst and have attended St. Ben’s church. On more than one occasion, I noticed an usher who looked somewhat familiar but didn’t inquire as to his identity. (My bad). Now, I’m betting it was you! Good to hear from you! I usher almost every week at St Benedicts at the 11:30 Am Mass. I inherited the job from my father. He was an usher there for 37 years . I am the only usher who does not wear a suit coat every Sunday . If you are at Mass when I am ushering, I will be sure to skip your row when taking up the collection . I havelost 80 lbs since November , 2012- I have not been this skinny since I was a teenager. Now if I could only grow my hair back! Hope to see you in church to discuss old times in “M” building. Great job on Bragging Rights! Had fun watching. Thanks so much! It was a fun show.